Even at birth, everyone is unique. Can heredity alone account for the complex differences in people's temperaments and styles? 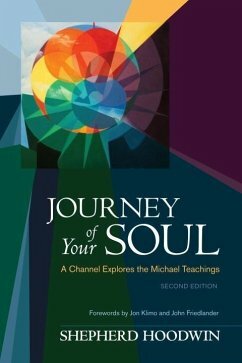 The Michael teachings, an extraordinary body of channeled work, propose that we are each unique souls who deliberately take on a specific combination of traits to give us the experiences we seek. In this fascinating book, Shepherd Hoodwin expertly discusses these teachings from his vantage point as a Michael channel. "Michael" is a group of souls who teach that we are eternal beings journeying from the Tao and back again in an adventure of exploration and creativity. Each step along the way, we make choices that shape our experience. For example, after committing to a series of lifetimes, we choose one of seven roles, or soul types: server, priest, artisan, sage, warrior, king, or scholar. These teachings address many age-old questions, such as "How did we become who we are?" "Why are we here?" "Where are we going?" and "How does the universe work?" In addition, Journey of Your Soul sheds light on the channeling process itself, answering questions such as "How does channeling work?" "Why do different channels receive conflicting information?" and "What does it take to become a channel?" Hoodwin shows us that it is possible, and indeed beneficial, to engage all parts of the human consciousness. His unique analytical approach to channeling will help readers gain a firm intellectual understanding of what is involved. In his foreword, Jon Klimo, PhD, author of Channeling: Investigations on Receiving Information from Paranormal Sources, says, "Shepherd Hoodwin has given us one of the best books to date about the phenomenon of channeling. Journey of Your Soul may well also be the best of the Michael books due to its clarity, thoroughness, and detail, and thanks to the fact that the author, an exceptionally clearheaded Michael channel himself, brings real integrity and authenticity to our understanding of Michael in particular and to the channeling process in general." Shepherd Hoodwin has been channeling since 1986. He specializes in the Michael teachings, and practices healing, mediumship, past-life readings and therapy, counseling, and coaches others to channel. Professor of Psychology at the APA-accredited Argosy University, Jon Klimo, PhD, is considered to be the world's leading authority on the subject of channeling and is the author of the definitive work Channeling: Investigations on Receiving Information from Paranormal Sources. John Friedlander has been teaching psychic skills since the 1970s. He coauthored Basic Psychic Development and Psychic Psychology with Gloria Hemsher. The author lives in Laguna Niguel, CA.